The Whale mAPP team of Lei Lani Stelle, Melo King of Smallmelo Geographic Information Services, and me (Courtney Hann) has been busy recruiting ocean enthusiasts and applying for grants to fund volunteer-suggested Whale mAPP revisions. As a refresher, Whale mAPP is an Android-based mobile application that can be used by anyone to record marine mammal (whale, dolphins, porpoises, pinniped) sightings around the world. It is easy to sign up as a beta tester on the Whale mAPP website, www.whalemapp.org, and use the mobile app on your personal device to help scientists and conservationists learn more about marine mammals. What is most spectacular is that the app has truly gone global! We now have over 100 users and are getting a couple new user requests each week! These volunteers have been busy at work this summer, recording thousands of marine mammal sightings during the summer months. Sightings have streamed in from the U.S. West Coast, Hawaiian, Japanese, and Russian waters, the Caribbean, the middle of the Southern Ocean, and the Greenland Sea. You can click on any sighting on the web map to see details about what species were recorded, how many were seen, what their behavior was like, the weather conditions that day, and other notes. 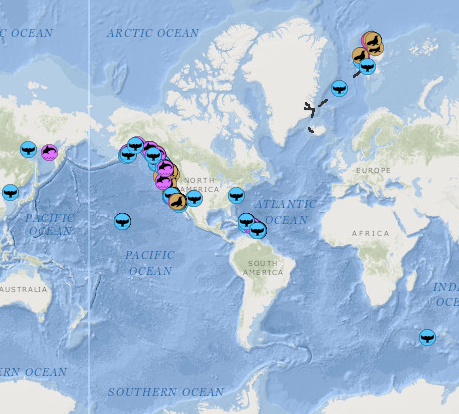 This map shows global marine mammal sightings recorded by Whale mAPP volunteers. The blue whale tale icons represent whale sightings, the pink dolphin icons represent dolphin or porpoise sightings, and the orange seal icon represents a seal, sea lion, or sea otter sighting. Data recorded during each sighting include the location (automatic), the species, the weather and sea conditions, the number of individuals, and a five-star confidence rating (http://www.whalemapp.org/map/#/, CEBCO, DeLorme | Melodi King, MS GIS Program – Cohort 21, University of Redlands). If we zoom into my particular study area of Southeast Alaska, we see that volunteers are still doing a superb job at recording the abundant number of marine mammals in the area. 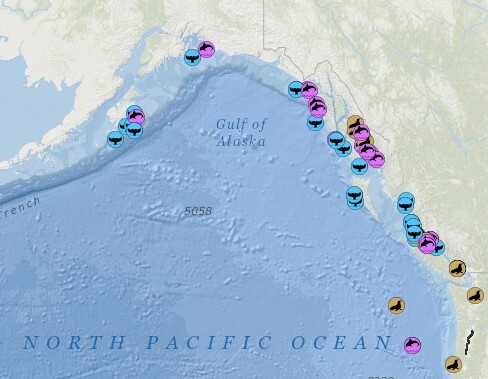 Zoomed in image of the northeast Pacific, showing marine mammal sightings recorded this summer in Alaska, Southeast Alaska, British Columbia, and Washington (http://www.whalemapp.org/map/#/, CEBCO, DeLorme | Melodi King, MS GIS Program – Cohort 21, University of Redlands). (1) Enable the user to edit observations during a trip and after a trip has ended. This revision is huge, was requested by almost every user I spoke to in Southeast Alaska, and was shown very evidently in our survey results. (2) Add site-specific animal behavior and descriptions to Whale mAPP. For Southeast Alaska, this means adding the famous bubble-net feeding behavior to our list, as well as important descriptions of how to identify, recognize, and understand marine mammal behaviors. In addition to the above two revisions, a few other revisions will be completed by Smallmelo Geographic Information Services this winter. These revisions include improving world-wide coverage of region-specific species lists, creating tools for validating the quality of the data, enabling data downloads directly from the website (www.whalemapp.org), and including the beta-tested “marine mammal fun facts” into the global application. All of these incredible accomplishments and progress toward a successful, educational, fun, and data-generating marine mammal citizen science project could not have happened without Dr. Lei Lani’s open mind toward incorporating more people, including me, into her Whale mAPP project. Whale mAPP represents a new age of scientists, one of collaboration across disciplines (ecology, statistics, coding, education, and more! ), and one that over-steps previous boundaries to re-define science. I hope that my participation with Whale mAPP and future citizen science projects will inspire individuals to know and feel that they can be scientists and that we can inspire the world to work together for the common good of our oceans.